Difficulty Notes: Slightly more difficult than Southfork Mountain but still only easy scrambling with some routefinding to keep it easy. Note: The statistics include both Southfork and Barnaby. 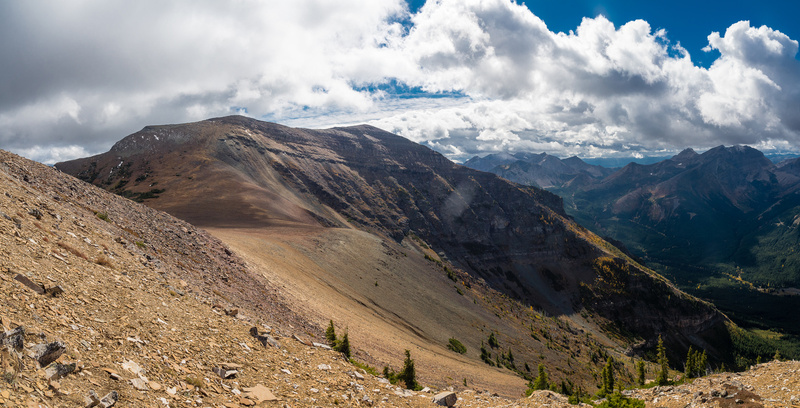 After getting over a serious lack of motivation and summiting Southfork Mountain, I decided to give myself an hour towards Barnaby Ridge to see where that would take me. The weather seemed to be clearing a bit but the wind was pretty strong (normal for the Castle Wilderness Area!) 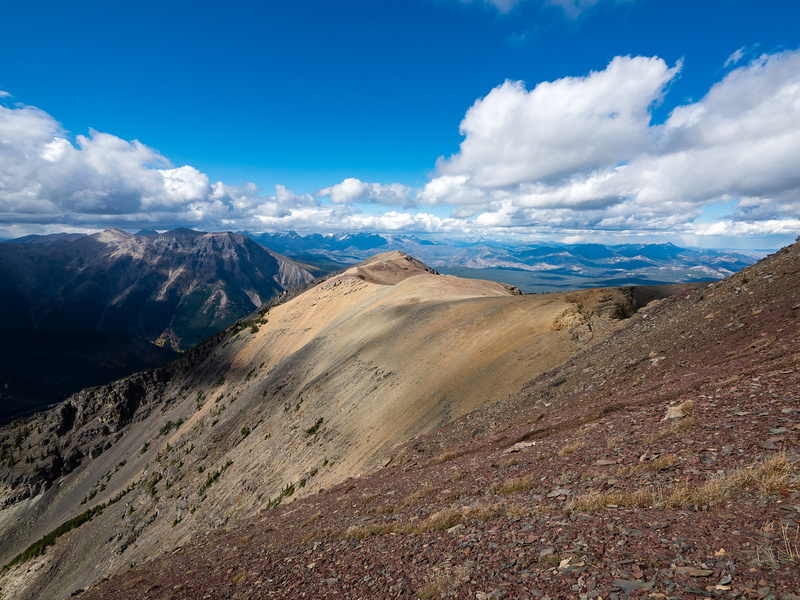 so I bundled up in my Gore-tex layers and trundled off, south along Barnaby Ridge towards it’s unseen summit. The weather continues to cooperate as I drop down towards the interesting bench traverse towards Barnaby. 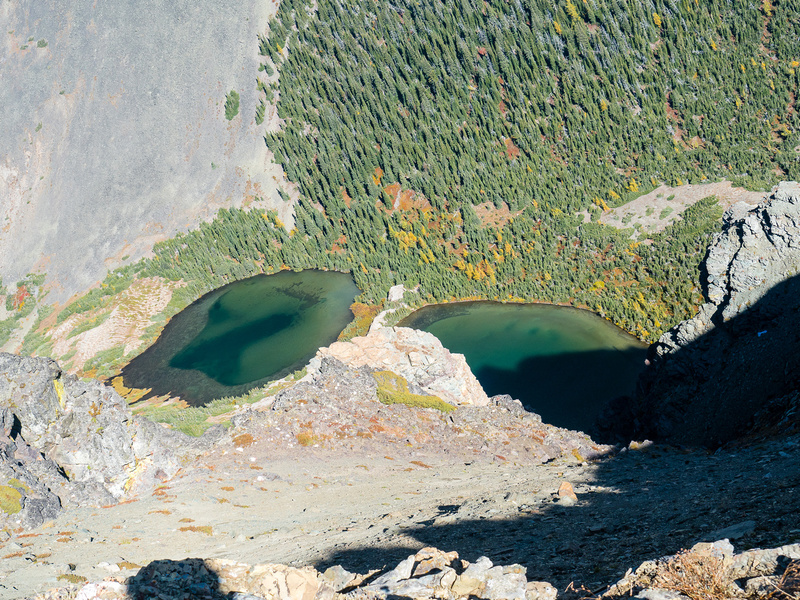 After dropping down to yet another col along the ridge I found myself on a pretty neat bench and obvious bivy spot. This would be a great place to spend a night just above treeline with some pretty killer views towards Castle Mountain and Windsor Peak. I took a quick break here and made my final decision. I was feeling it. I was going to bag Barnaby today. 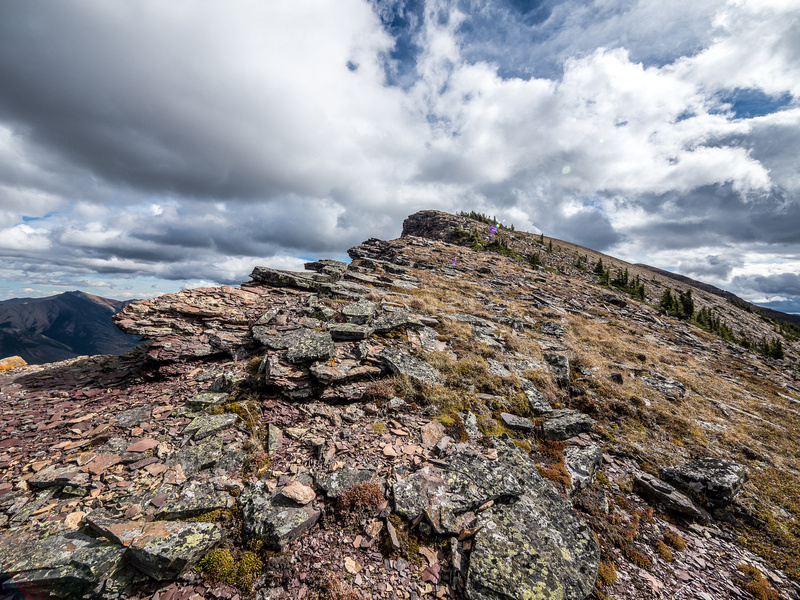 I set up doing just that, traversing upwards towards the second high point along the ridge. The nice ‘bivy bench’ on the way to Barnaby Ridge. 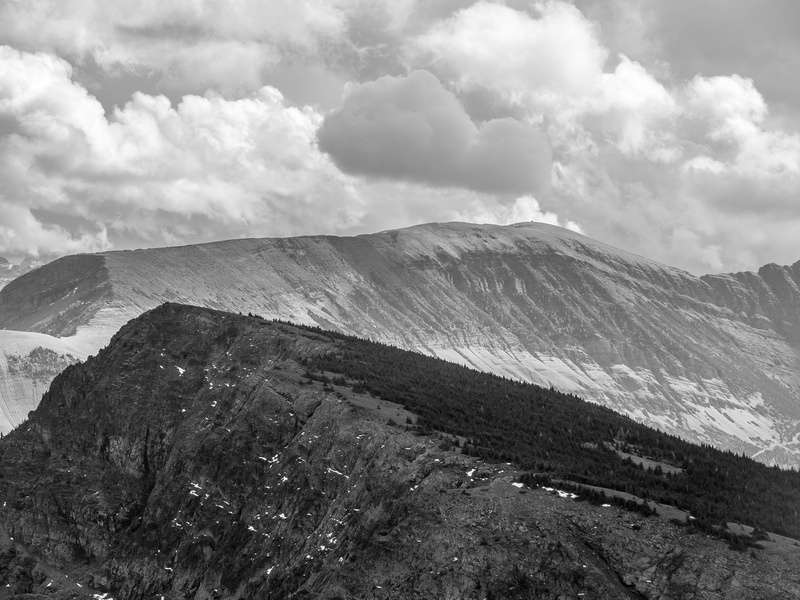 The final drop before Barnaby wasn’t too bad – the summit looked awesome in the play of sun and clouds and I was feeling pretty good about making a double summit on a day when I really didn’t expect to make even one. 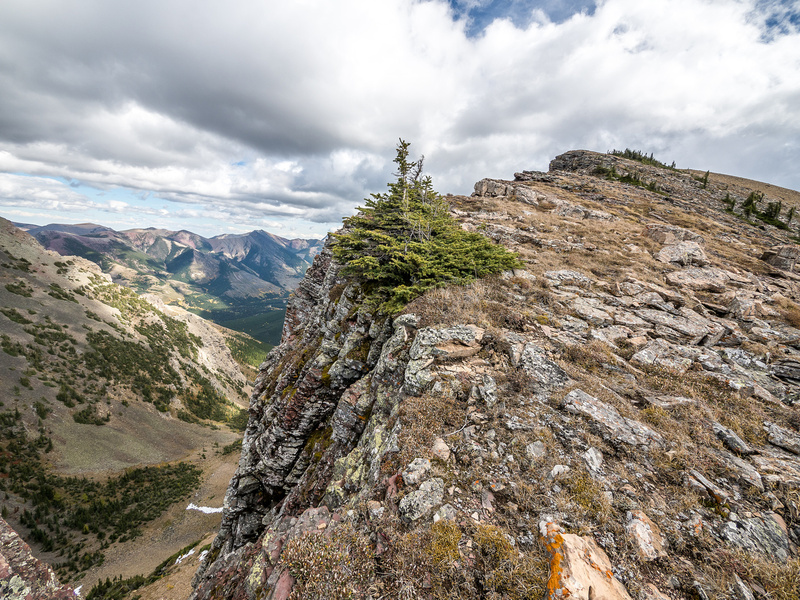 The views towards Castle Peak and her surrounding peaks were pretty darn spectacular as I groveled and hobbled my way up to the summit of Barnaby Ridge – thankfully the closest high point for once! At the summit I traversed a bit to the east to get some unbelievable views of Castle and Windsor mountains. I was pretty stoked to be standing there all alone with the wild scenery of fall spread out underneath me. 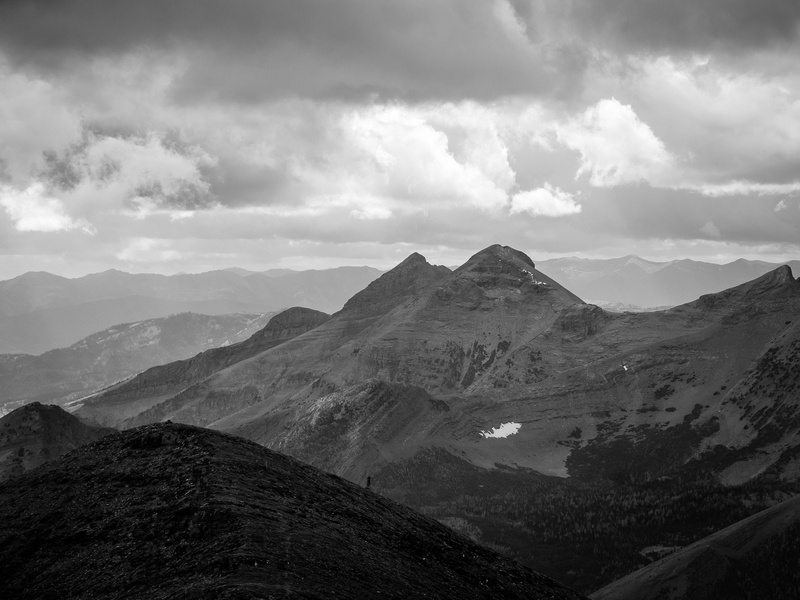 Familiar Castle peaks like Haig, Gravenstafel, Syncline, St. Eloi, Victoria and Table stood out like old friends. 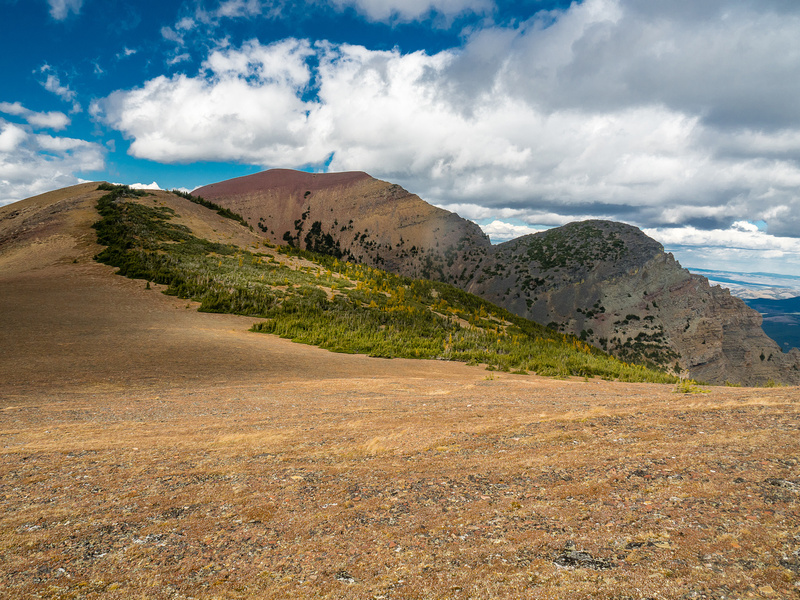 An incredible summit panorama of the Castle Wilderness Area from the summit of Barnaby Ridge, looking north (L), east (C) and south (R). 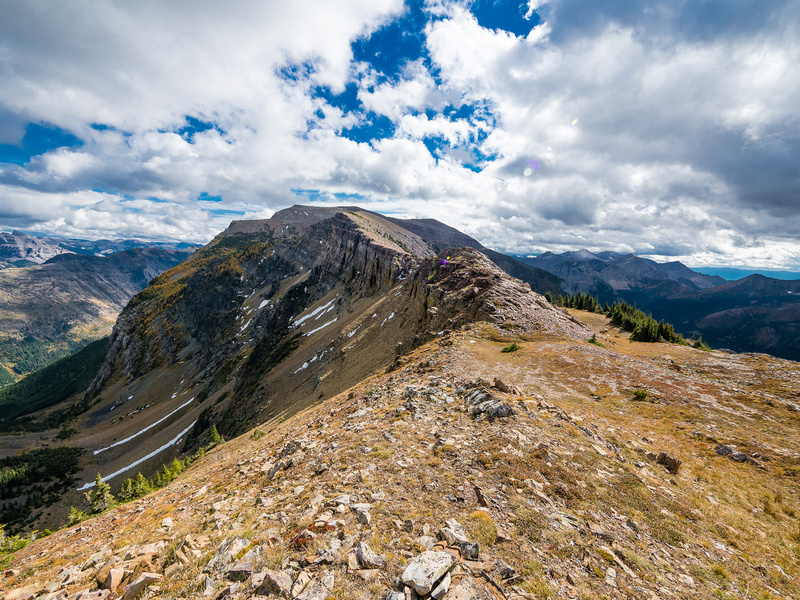 From left to right summits include, St. Eloi, Syncline, Southfork (hidden), Table, Whistler, Gladstone, North Castle, Victoria, Castle, Windsor, Pincher Ridge and West Castle. 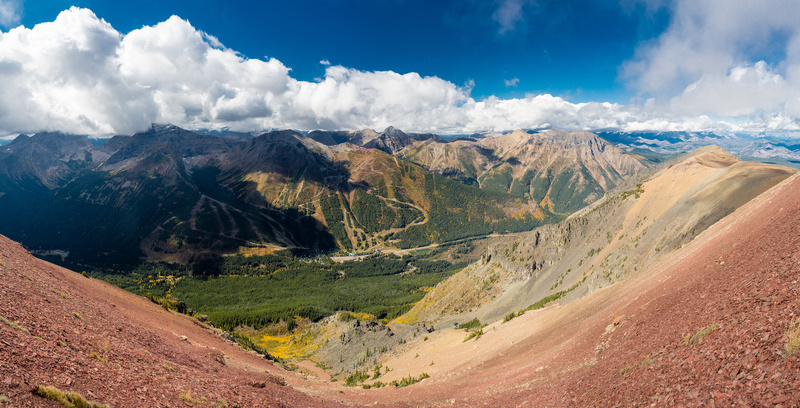 Another angle on the fantastic alpine bowl between the first intermediate bump from Southfork to Barnaby and the second one (this taken on return). 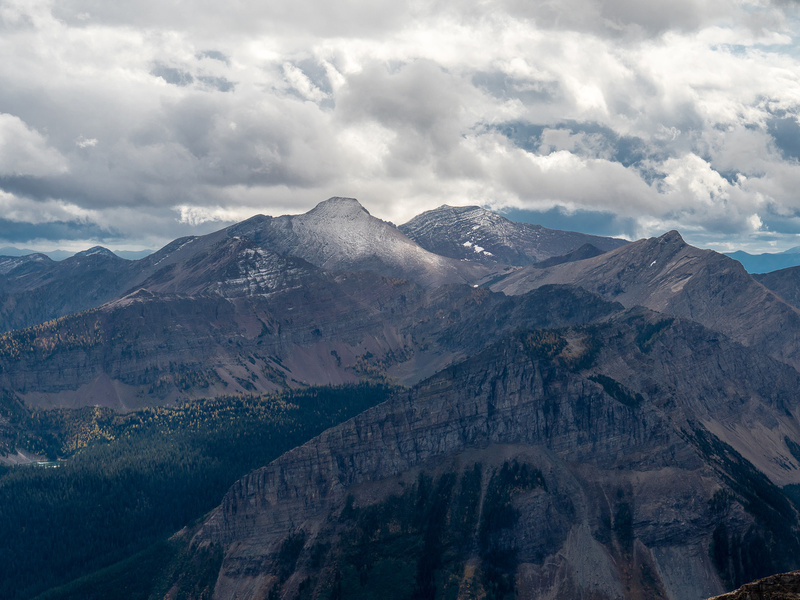 Castle Peak, West Castle Peak and Windsor (L to R). 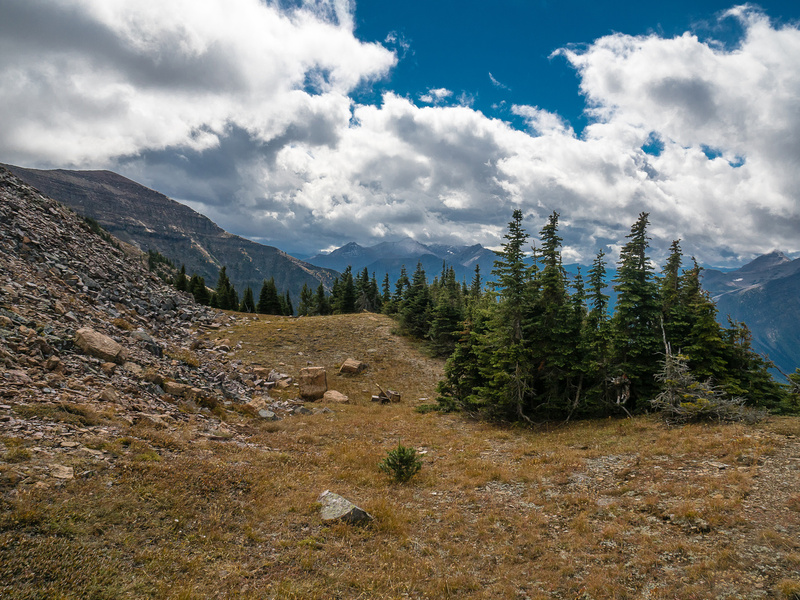 A compressed panorama looking north to Crowsnest Mountain and the Crowsnest Pass area. 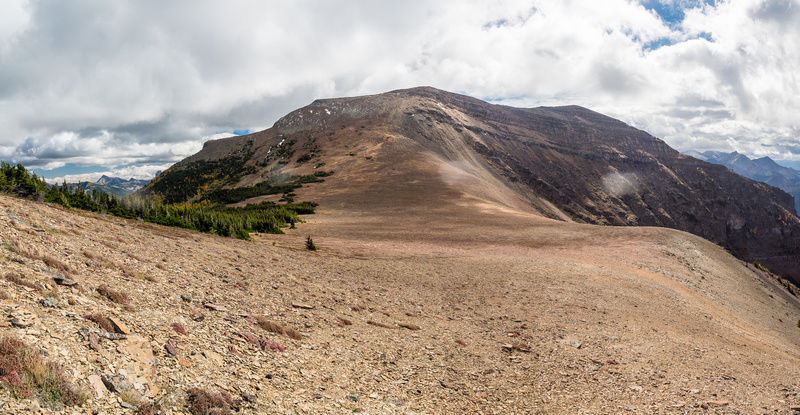 After snapping way too many photographs I reluctantly turned around and looked at the traverse back towards Southfork. 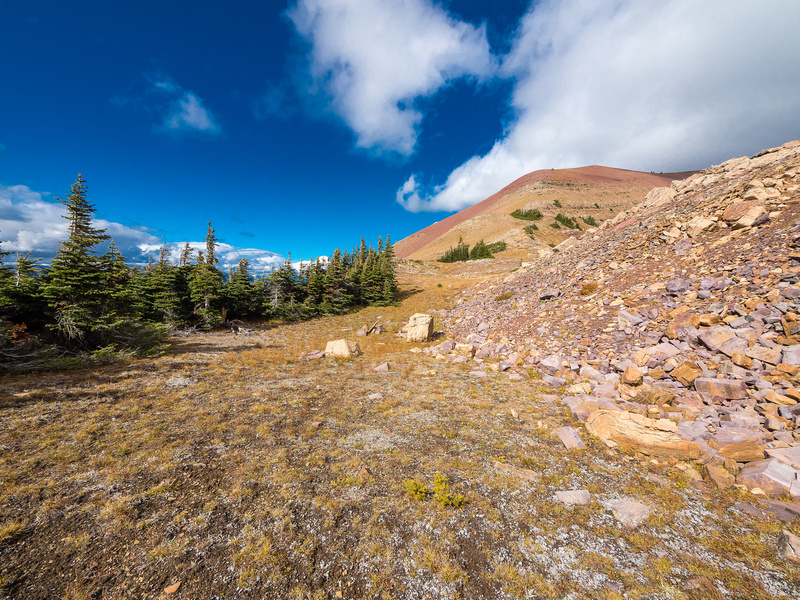 The only disadvantage of doing the route via Southfork Lakes is that you either need to reverse all the ups and downs along the ridge back to Southfork or drop down and hike a bunch of kilometers to your car. The dropping down option is easiest but boring. 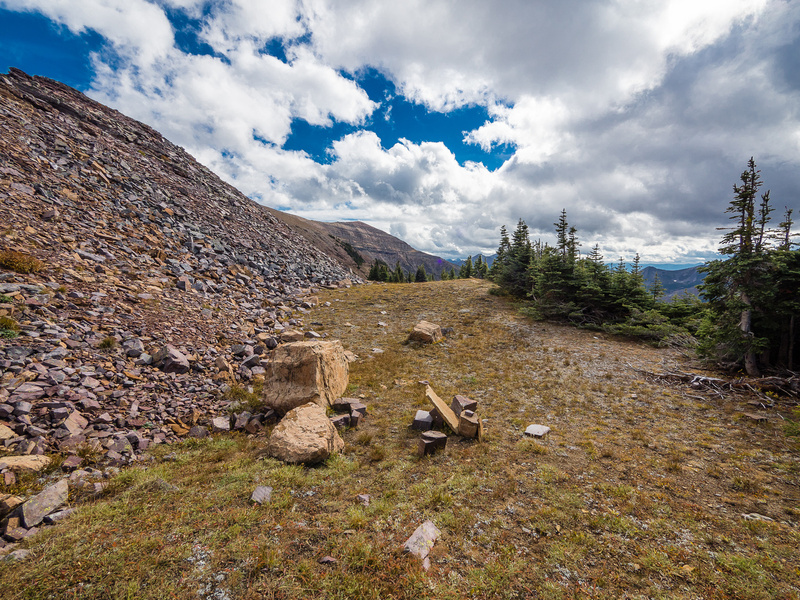 So I chose to go back along the ridge to the summit of Southfork Mountain. The views were great again on the way back which dulled some of the pain. 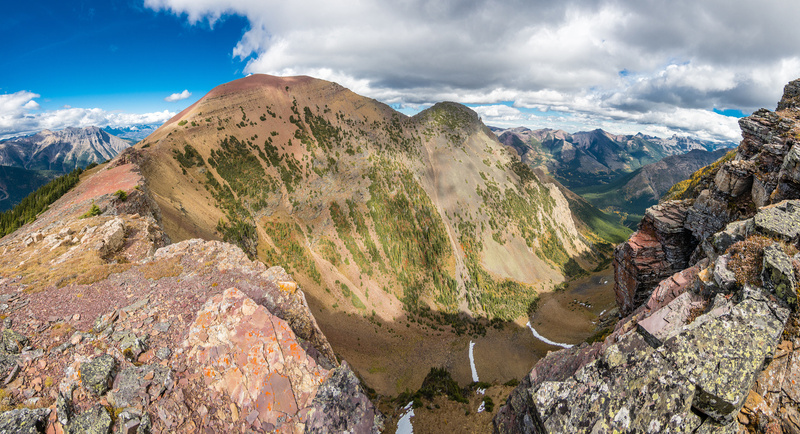 Looking towards the first serious elevation gain on Barnaby's north ridge from Southfork Mountain. The ridge is easily followed from Southfork - the Castle Ski Resort seen at center. The weather is still pretty gloomy at this point. The only real scrambling of the day is going up the north end of the first bump from Southfork. Looking west and north from the traverse of the first bump. Southfork at far right. Barnaby Ridge summit looks a long ways off after the first bump is passed from Southfork. Traversing another intervening bump towards Barnaby. 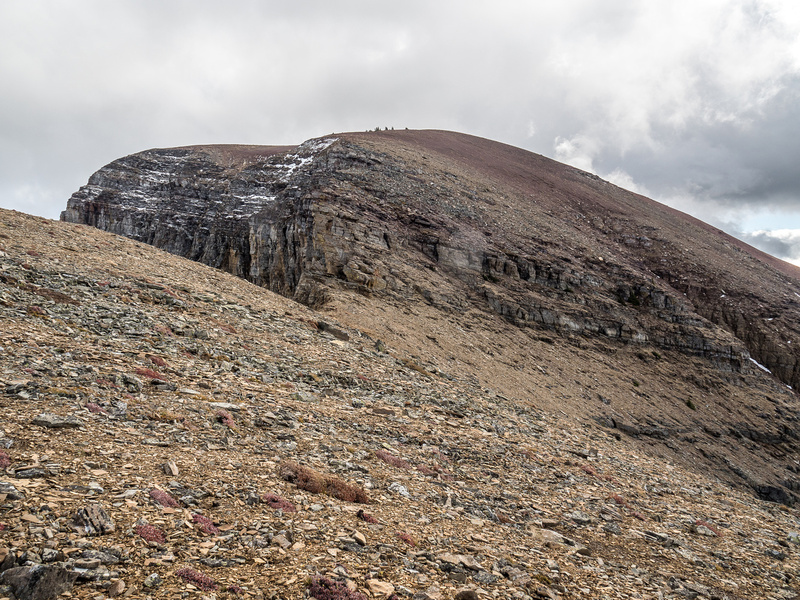 The easy summit slope of Barnaby Ridge is all that stands in my way of a second peak today. 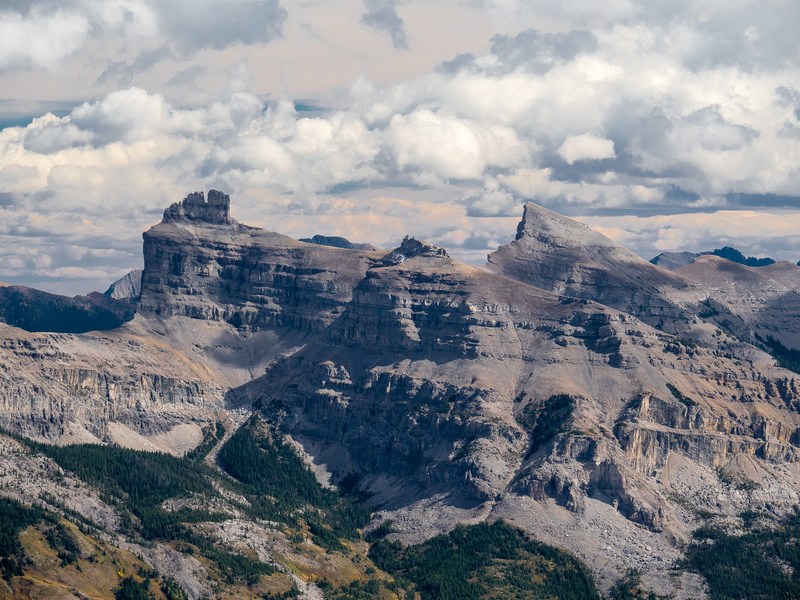 From left to right summits include, St. Eloi, Syncline, Southfork (hidden), Table, Whistler, Gladstone, North Castle, Victoria, Castle, Windsor, Pincher Ridge and West Castle. Lovely colors of Beaver Mines Lake and Table Mountain. One of my favorite shots from the Castle area includes Victoria Peak, Castle Peak, West Castle Peak and Windsor (L to R). 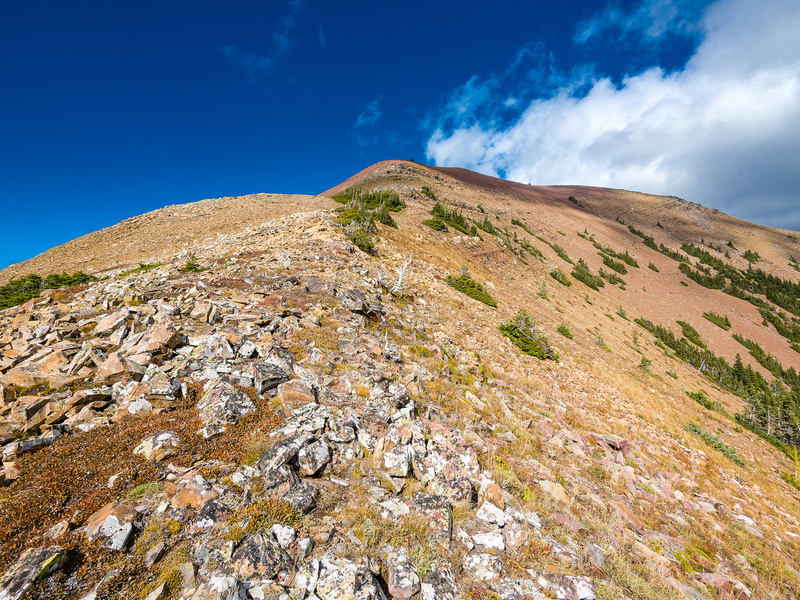 La Coulotte Peak with Sunkist Ridge to its right. West Castle / Lys Ridge at center left and La Coulotte just right of center. Scarpe Mountain at right. Castle Ski Resort clearly visible at lower left with Gravenstafel Ridge and Mount Haig visible at far left. 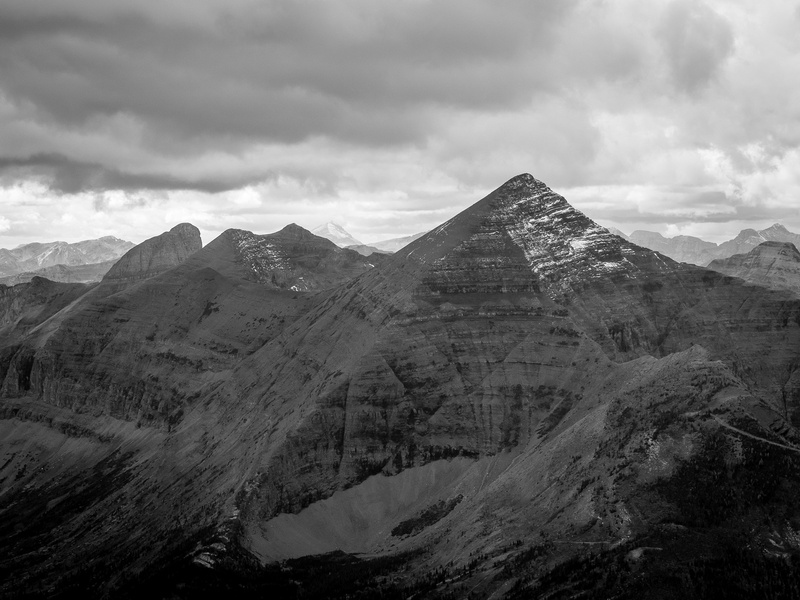 I love the pyramid shape of Mount Haig. 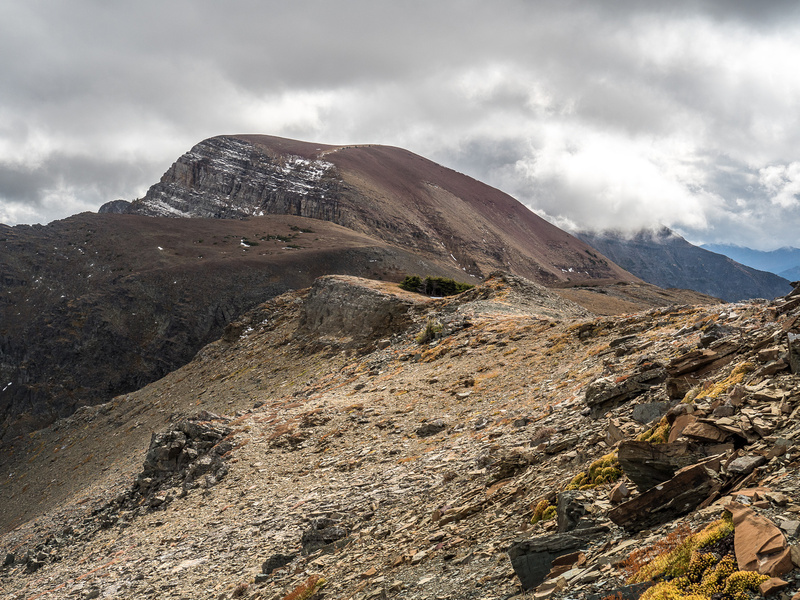 In the background at left is Tombstone Mountain. 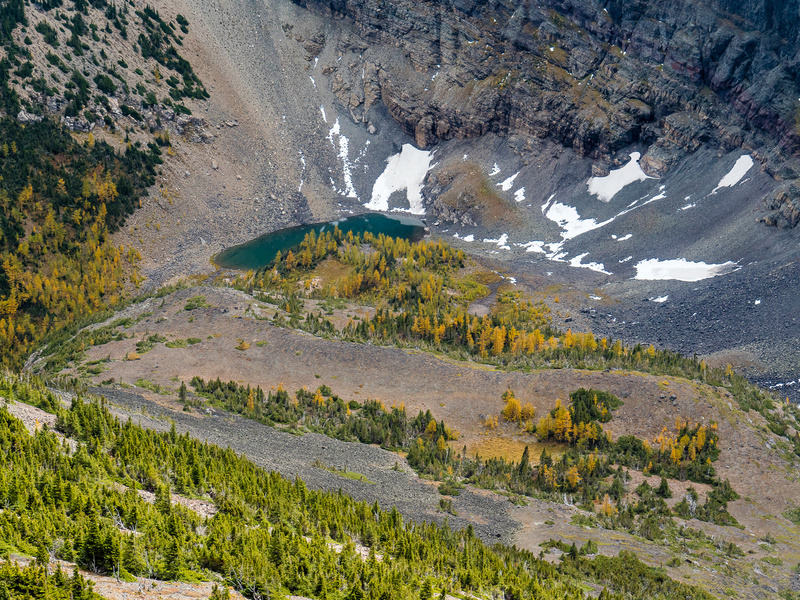 A small tarn lies just to the south of Barnaby Ridge surrounded by larches and probably sees very few human visitors. Looking north at my ridge walk to Southfork which is still out of sight behind the far red bump. 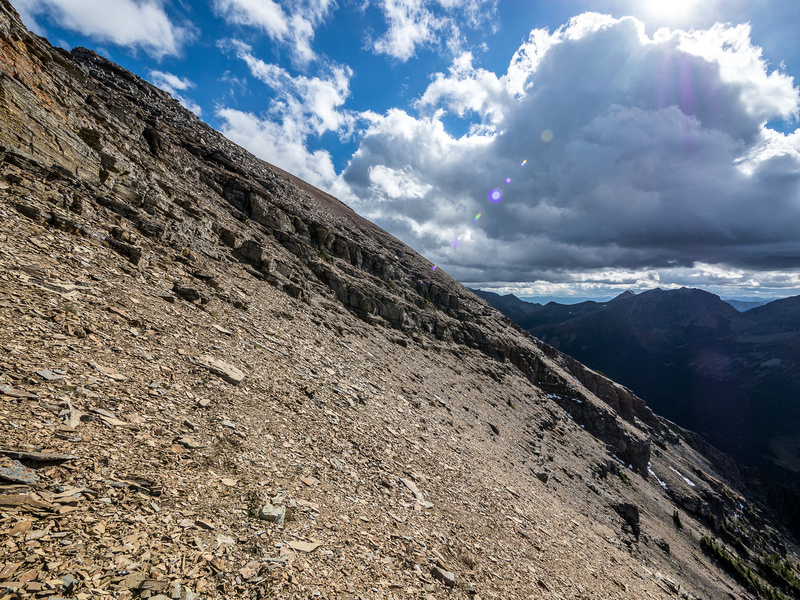 Looking back at a portion of the traverse beside the steep walls of the bowl. The nice 'bivy bench' on the way back to Southfork Mountain. Looking back at Barnaby as I start up the largest of the intermediate bumps. Regaining height on the largest bump just before Southfork. Traversing on the west side of the bump, looking north to Southfork Mountain in the distance. Looking back at the easy scrambling section at mid-left here. 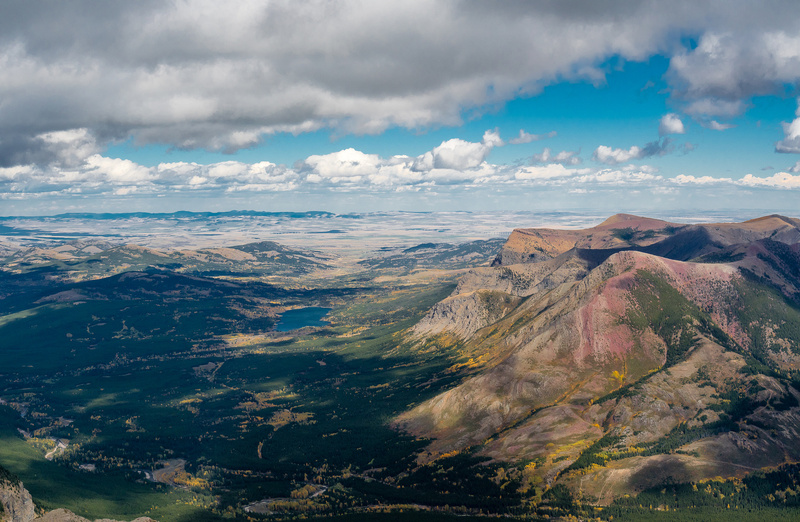 Views of Middle (L) and Upper (R) Southfork Lakes from the north ridge of Barnaby. Telephoto of two of the Southfork Lakes from the ridge.